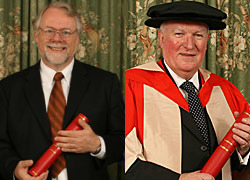 The University of Reading is delighted to announce it has awarded Honorary Degrees to Lorna Arnold, the foremost expert on the early history of Britain's nuclear weapons programme and Tim Ford, former University of Reading Council President and a successful lawyer who has dedicated his time and expertise to public service. Both received their degrees at this year's December Graduation Ceremony. Lorna Arnold OBE was awarded the Honorary Degree of Doctor of Letters on Saturday 12 December. Lorna, aged 94, is the foremost expert on the early history of Britain's nuclear weapons programme. She was probably the first female British diplomat and was posted to Berlin, shortly after the German capitulation to work in the Allied Control Commission. This, arguably, is where the Cold War started. In 1959 she joined the British Atomic Energy Authority and together with Margaret Gowing, she published a famous history of British nuclear energy from 1945-1952: Independence and Deterrence. Lorna Arnold was awarded an OBE in 1976, and after Professor Gowing's retirement de facto took over the work of the official historian of the UK Atomic Energy Authority when she herself was well past retirement age." Lorna was presented for the Honorary Degree of Doctor of Letters by Professor Beatrice Heuser, from the University's School of Politics and International Relations. Professor Heuser said: "When Lorna was 72 she started to write articles and monographs of her own, including most notably a book on British atomic weapons trials in Australia. At an age where others would have been content to settle into retirement, Lorna slipped out of the cocoon of a researcher to unfold her wings as a leading scholar in her own right. This is the primary achievement that we honoured on Saturday." Tim Ford was awarded the Honorary Degree of Doctor of Laws on Friday 11 December. Tim was admitted as a solicitor in 1969, and two years later had become a partner, specialising in matters commercial and corporate. He became Managing Partner of his law firm, Park Nelson and from 1996 - 2002 he led the firm through a period of expansion and significant consolidation in the legal profession. This led to the merger of the London-based Park Nelson into the large provincial firm of Lester Aldridge. Tim's time in the Territorial Army highlighted his leadership skills so evident throughout his career. In 1991 he began an association with the London hospitals which was to last for nearly 10 years. Tim was non-executive Director with the Guy's and Lewisham NHS Trust; then, in 1993 he became Deputy Chair of Guy's and St Thomas' Hospital Trust, a position he held for seven years. Tim's commitment and loyalty then switched to the University of Reading. During his nine years with the Institution he was a member of Council before being appointed its President, his term ending this Summer. Tim was presented for the Honorary Degree of Doctor of Laws by University of Reading Deputy Vice-Chancellor Professor Tony Downes. Professor Downes said: "Tim Ford is a true friend of the University of Reading. He has made many important contributions, sometimes by leading from the front, often by quiet advice, encouragement and support. One of the most significant was to be part of the small search committee responsible for finding a new Vice-Chancellor. We have also seen the establishment of a clear and attractive visual identity for the University and the merger with Henley Management College. Perhaps most importantly of all, he encouraged the University to go out and tell the world about ourselves and have the ambition to be among the very best." Lorna Arnold's son Geoffrey received the degree on her behalf on Saturday 12 December from the University's Vice-Chancellor Professor Gordon Marshall. Tim Ford received his degree on Friday 11 December from the University's Chancellor Sir John Madejski.